Even with expectations low, today's advance estimate of second-quarter GDP from the BEA was disappointing. 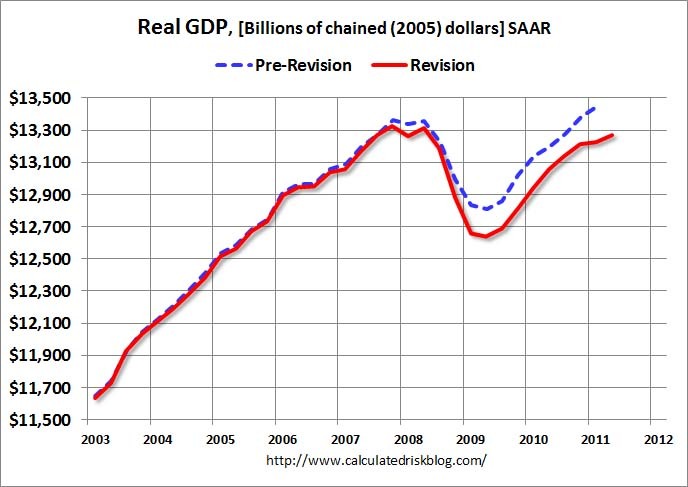 Real GDP grew at a 1.3% annual rate in the second quarter of 2011, and the first quarter's growth rate was revised downward to 0.4% (from 1.9% previously estimated). Government purchases - the G component in the national income accounting identity - was a drag on real GDP for the third consecutive quarter. In the second quarter, G decreased at a 1.1% annual rate (larger declines in federal nondefense and state and local government spending were partly offset by an increase in defense spending). Consumption was basically flat (increasing at 0.1% annual rate), while investment rose at a 7.1% pace. Net exports also made a positive contribution: exports increased at a 6% rate, compared to 1.3% for imports. 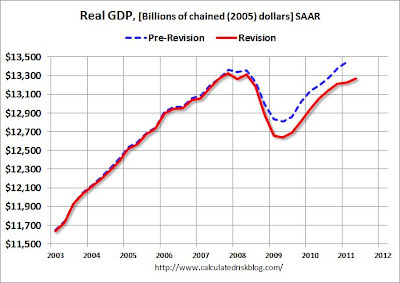 According to the revised numbers, real GDP has not returned to its pre-recession level, as we had previously believed. This makes the badness of the labor market somewhat less of a puzzle - the rise in unemployment had been more than the fall in output seemed to warrant based on historical relationships, but now we know that output was lower than we thought. IN 2007, the great ship of the American economy began encountering darkening skies. In 2008, it was suddenly faced with a violent storm which blew it miles off course, well south of where it ought to have been. The country's leaders didn't know how far from their charted path they'd been swept, but they recognised a need to make a course correction. Now, three years later, a look at the maps tells us that the storm was more powerful than previously believed, and it left the vessel much farther south than anyone had expected. The course corrections made earlier? Far too small to bring the ship back to its previous path. Yet none of America's leaders are trying to steer the ship back northward. Indeed, many seem anxious to yank on the tiller and drag the economy farther south still. Brad Plumer has a nice post on what the data suggest about the recovery act (a.k.a., the "stimulus"), and Brad DeLong has some quick policy suggestions (though there's little reason to hope we'll see anything like them). Real Time Economics rounds up Wall Street "economist" reaction. The young Bill was clearly very talented, but his parents reluctantly decided that they could not afford to keep him at school, and any dreams of a university education were abandoned. Aged 15, Bill signed up as an apprentice electrician with the government's Public Works Department, which at that time was building infrastructure around rural New Zealand. He spent the next few years roughing it at working men's camps in remote rural sites, helping to build hydroelectric dams to generate electricity for the national grid. Bill had played with photography and seen early movies, and he was fascinated by the idea of ‘talkies’. He hired a hall in the Tuai camp and set up the first talkies cinema. Recreation involved playing his violin, riding an acquired motorbike and reading his treasured encyclopaedia of world religions. But rural New Zealand was not enough. Phillips wanted to sample the world. In 1935, still aged only 21, he packed his swag and his fiddle, and shipped to Australia. Here he spent a couple of years travelling the outback, hitching rides on freight trains and working in mining camps. Money came from a range of jobs: picking bananas, working on building sites, mining gold, running a cinema, and even crocodile hunting. These were tough jobs in a rough country, but at the same time Phillips had set his intellectual sights higher. He enrolled in a correspondence course in electrical engineering and remembers learning his first differential equations under a harsh Australian sun at an outback mining camp. Phillips had a lifelong fascination with Eastern cultures. In 1937, despite the worsening international situation, he boarded a Japanese ship to travel to Shanghai. While he was at sea, the Japanese invaded Manchuria, and the ship was diverted to Yokohama. Phillips took advantage of this by travelling around the newly militarized Japan; at one point he was detained by the authorities, who suspected that he might be a spy. Eventually he made his way out through Korea, Manchuria and Harbin, and crossed Russia on the Trans-Siberian railway. With Antipodean optimism, he looked for casual jobs across Soviet Russia, only to find them all taken by political prisoners. From Stalin's Moscow he travelled on through threatened Poland and Nazi Germany during the fragile last years of peace. He settled in London, where he found work as an electrical engineer. Having continued his correspondence course, Phillips now graduated from the Institute of Electrical Engineers, gaining his first formal qualifications. He also took classes in several languages. Fortunately, Economica has given free online access, so you can read the rest, including his World War II adventures. There is also the story of his famous machine - I posted a video of it in operation here. In a follow-up to the Economist article, David Altig, with basic agreement from Paul Krugman, argued that it was a misnomer because I developed and used macro models (now commonly called New Keynesian) with price and wage rigidities in which the government purchases multiplier is positive (though usually less than one), or because the Taylor rule includes real variables in addition to the inflation rate. In my view, rigidities exist in the real world and to describe accurately how the world works you need to incorporate such rigidities in your models, which of course Keynes emphasized. But you also need to include forward-looking expectations, incentives, and growth effects—which Keynes usually ignored. "Keynesian" means different things to different people - at its broadest, it means accepting that there are frictions in the economy which mean that aggregate demand matters and policy can have real effects. This is in contrast to the pure classical view, in which Say's law holds, demand is irrelevant, and output depends on technology and preferences. In the version of Keynesian economics in our undergraduate textbooks - the IS-LM/AS-AD framework - the frictions are nominal rigidities and the Keynesian model deals with "short run" fluctuations around a "long run" equilibrium determined by the classical model. In this setting, both monetary and fiscal policy matter (by shifting the LM and IS curves, respectively), though early Keynesians emphasized fiscal policy and "monetarists" (most prominently Milton Friedman), gave primacy to monetary policy. The version of Keynesian economics in our graduate textbooks and academic journals - "New Keynesian" - combines dynamic optimization with sticky prices, and explicitly addresses the lack of "forward looking expectations" in the traditional textbook version. Furthermore, some argue that both the IS-LM and New Keynesian incarnations really miss the point and gloss over more fundamental irrationality and instability Keynes saw in the capitalist system. As Taylor describes his views of the economy (and from what I know of his academic work), it seems consistent with mainstream New Keynesian economics (though his version has been less favorable to fiscal policy than some others). His criticism of recent fiscal and monetary policy grows out of another longstanding conundrum in macroeconomics, "rules versus discretion." He is not claiming that countercyclical fiscal and monetary policy are fundamentally impossible, which is what I would say is the true "anti-Keynesian" view. Rather, he is arguing that discretionary policy may do more harm than good, and policy should be based on stable, predictable rules. A primary argument for rules is that discretionary "fine tuning" is impractical based on "long and variable" lags associated with (i) recognizing the state of the state of the economy, (ii) designing and implementing a policy and the (iii) the policy's impact reaching the economy. Often lurking behind this argument is a political philosophy that is skeptical of government (no coincidence that Milton Friedman was the most famous proponent of rules - Brad DeLong recently argued this is how he resolved the contradiction between an economics that said monetary policy can be effective with a libertarian political philosophy). Taylor is careful to say that he opposes "discretionary Keynesian policy" - I think "anti-discretion" might be a better characterization of his critique than "anti-Keynesian." Of course, that only matters if it is possible to be "anti-discretion" without being "anti-Keynesian." I think it is. I don't share the political philosophy, but the experience of the last several years has underscored the practical difficulties of discretionary policy. The early-2009 Obama administration with large congressional majority is about as close to government by center-left mainstream Keynesian technocrats as the American political system is likely to ever give us. In retrospect, it is clear they misjudged the scope and duration of the downturn and were not able make adjustments as that became apparent. Monday morning quarterbacking in April, I suggested that the stimulus should have been designed in a "state-contingent" fashion to remain in place until the recovery reached certain benchmarks. It is a small step from there to a "rules based" countercyclical fiscal policy - policies like aid to state governments, extended unemployment benefits, payroll tax cuts and even increased infrastructure spending could be designed to kick in and ramp down automatically based on the state of the economy (e.g., with triggers based on the unemployment rate). To me, that's very "Keynesian", but also "rules-based", and its easy to imagine that might have worked better than the actual policies that were put in place. The first problem was conceptual. What Keynes told us to do simply feels wrong to people. “The central irony of financial crises is that they’re caused by too much borrowing, too much confidence and too much spending, and they’re solved by more confidence, more borrowing and more spending,” Summers says. Many of us economists believe Keynesian policies have been successful, and that more would have been better, but politics doesn't judge outcomes relative to a counter-factual scenario. That is, the argument that things would have been far worse in the absence of a policy isn't a winner, even if it is correct. Unfortunately, that means future policy makers are likely to draw exactly the wrong lessons, and do even worse next time (at least on the fiscal side; central bank independence gives monetary policy some space to follow academic rather than political views). Furthermore, as Paul Krugman explains, the economics profession (or at least some parts of it) isn't playing an entirely helpful role. Some have likened Greece's situation today to Argentina's in 2001, when, after repeated austerity "cures" failed, it ultimately was forced off its peg to the dollar and suffered a severe crisis, but a floating currency ultimately facilitated a recovery. In a Vox column, former Argentine finance minister Domingo Cavallo offers some reflections on Argentina's experience and what it suggests for Greece. Unfortunately for them, he says "Greece’s crisis is much more difficult to manage than the 2001 Argentinean crisis." (Yikes!!). He offers some suggestions on how the debt restructuring should be done (and I think everyone who isn't a European government official sees that it needs to be done), but doesn't think Greece should leave the Euro. A really bad employment report - according to the BLS, the economy only gained 18,000 jobs in June and the unemployment rate ticked up to 9.2% (from 9.1%). The government continues to be a drag - private sector payrolls increased by 57,000, but government employment shrank by 39,000. The employment numbers are calculated from a survey of businesses; the numbers from the BLS' survey of households (from which the unemployment rate is calculated) are even worse - the number of employed persons dropped by 445,000 and labor force participation decreased to 64.1%. On a non-seasonally adjusted basis, the unemployment rate rose from 8.7% to 9.3% because of a large increase in the labor force (1.089 million, presumably due to the end of the school year) outstripped a small increase in employment (101,000). Non-seasonally adjusted payrolls rose by 376,000. The comparison between seasonally-adjusted and unadjusted numbers shows that June is a month that normally sees a big increase in labor force participation and employment, and this June's increase in employment is disappointing compared to what we would expect for this part of the year (and what is needed to keep pace with changes in the labor force). See also: Tim Duy, Menzie Chinn, Calculated Risk, Greg Ip. ...[P]olicy makers should provide additional macroeconomic support in 2012 by extending the existing payroll tax holiday. 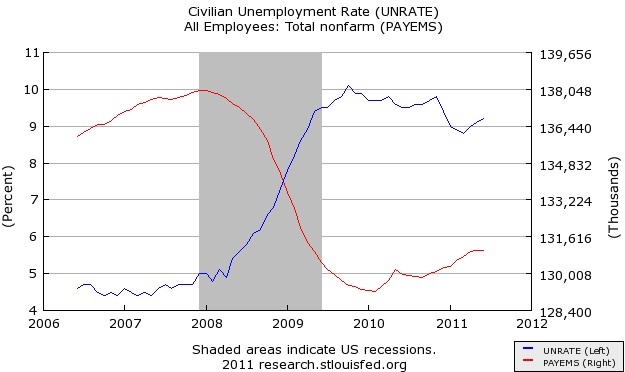 But more than that, Congress should link the payroll tax to the unemployment rate. This would allow the tax holiday to automatically calibrate itself to existing conditions, providing support only when the economy is weak. If necessary, the underlying payroll tax rate could be raised to make this mechanism budget-neutral. As I said back in April, one of the main lessons I've drawn from recent experience is that the recovery act would have been much better if the support for the economy had been made state-contingent like this. This is a way of overcoming two problems: (i) uncertainty about the speed of recovery (or lack thereof) and (ii) the political system's utter inability to deal with timing issues (nicely explained in Orszag's piece), as evidenced by the absurdity that it appears that we are heading for significant fiscal tightening even as nearly 14 million people remain unemployed.